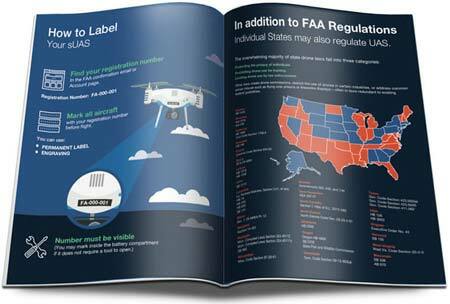 Select the type of FAA Drone Registration you need. Recreation only, select Recreational FAA Drone Registration. Operating a drone for-profit business services you will select Commercial FAA Drone Registration. Recreational drone registration is for those who fly drones solely for recreation, and not for other non-hobby purposes. You will receive a certification and registration number by email. You must display your registration number on your drone. You may use the same registration number for many aircraft. Each must be individually labeled. 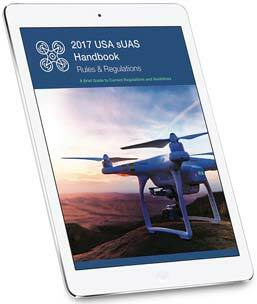 Download the sUAS Rules & Regulations Handbook. What is Recreational Use of a Drone? The operation of an unmanned aircraft for personal interests and enjoyment. For example, using a sUAS to take photographs for your own personal use is considered recreational. Using the same drone to take photographs or videos for sale would be considered a commercial operation. Drones must weigh less than 55 lbs. Must have registered with the FAA. 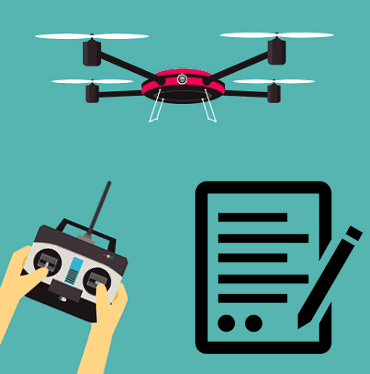 Obtain a remote pilot certificate from the FAA. Must be marked with a label containing registration information. Keep your drone in eyesight at all times, and use an observer to assist if needed. Remain clear of and do not interfere with manned aircraft operations, and you must see and avoid other aircraft and obstacles at all times. Do not fly over unprotected persons or moving vehicles, and remain at least 25 feet away from individuals and vulnerable property. Contact the airport and control tower before flying within five miles of an airport or heliport. Ensure the operating environment is safe and that the operator is competent and proficient in the operation of the drone. Do not fly near or over sensitive infrastructure or property such as power stations, water treatment facilities, correctional facilities, roadways, government facilities, etc. Follow the same requirements and operating rules for Commercial users, the FAA’s small UAS rule (known as “Part 107”). Commercial drone registration is for those who fly drones for commercial, government or other non-hobby purposes. Commercial drones will receive a unique Certificate of Aircraft Registration for each aircraft. You must display your registration number on your sUAS. You must pass an aeronautical knowledge test. What is Commercial Use of a Drone? Selling photos or videos taken from a drone. Using drone to provide professional services, such as surveying, inspection, security, real estate, wedding photography, tv etc. If you want to use UAS for a commercial purpose, you must hold a commercial registration and pass the Part 107 test. You may also apply for an 333 Exemption or Part 107 Waiver to operate outside of current regulations. The use of UAS by students in accredited educational institutions as part of their coursework will be allowed under recreational guidelines for model aircraft. The interpretation also clarifies that UAS can be operated for demonstration purposes at community-sponsored events, provided that the aircraft operator does not receive any compensation, related to the operation of the aircraft. Students can learn how to design, construct and operate small unmanned aircraft as a component of a variety of courses. These uses fall under recreational use, and schools and students should follow all the same rules as a Recreational Drone Pilot. A course instructor can only provide minimal assistance to a student flying a UAS when the primary purpose of the course is not operating the UAS.